CHICAGO (WLS) -- Landscape architects for the Obama Presidential Library took ABC7 Eyewitness News on an exclusive tour of some South Side community gardens as neighbors watch plans for the center with great interest. Over 10 million heads of lettuce are harvested each year from a garden in the Pullman neighborhood. Gotham Greens makes the most of a roof off 111th Street. "It's wonderful to see fresh foods being grown here in Chicago," said Ernie Wong, landscape architect. The rooftop garden is among several local gardens getting some special visitors. Today the team of landscape architects designing the community garden at the Obama Presidential Center wanted to see what is growing on the South Side. They invited ABC7 on the tour. 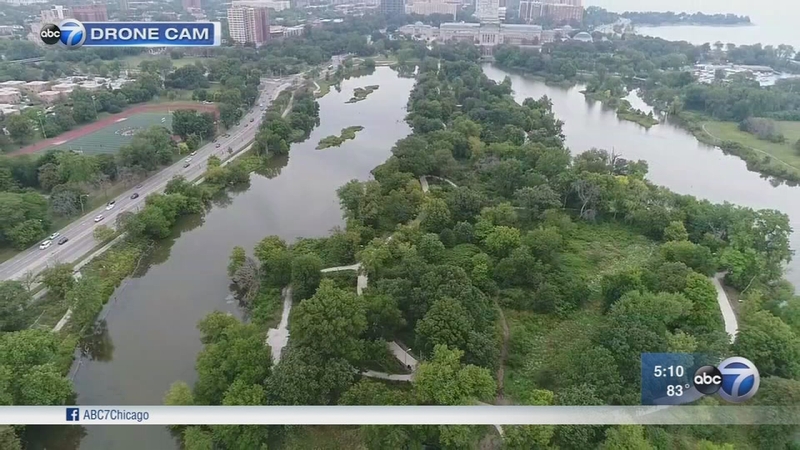 Jackson Park, as seen by the ABC7 drone on this summer day, show the Garden of the Phoenix and Wooded Island along Cornell Avenue. The Presidential Center proposal eliminates Cornell Avenue and puts a rooftop community garden on top of the library. Anton Seals, Jr., is a South Side resident who is working with the Obama South Side Community Benefits Coalition said he thinks the plans are amazing, and representative of a step forward in how development Is done in Chicago. The Obama CBA Coalition is hosting a series of community meetings about the center starting Wednesday night to make sure the center benefits all neighborhoods nearby.